In late 2016 we started working with the media department at Totton College on plans to install a future proof television production suite for their students to help learn and develop their skills. Their specification was to assemble a simple lightweight system that their students could operate within a fixed studio environment, but that was also lightweight and portable enough to be used for field broadcasting and also for use in the college’s affiliated theatre. With this in mind we put together a very small 4U flypack. Based off of the Blackmagic 4K Production suite. This switcher was chosen due to its small form factor and the fact that it gave the college the option to easily upgrade to a full 4K live workflow if the cameras became available. Within the 4U rack we mounted all the power distribution and networking required to run the ATEM switch and also integrated provisions for a possible future coms and tally upgrade. All this was interfaced with a set of custom patch plates and finished with the appropriate blanking and vent panels. With everything contained in the single rack the students could easily move the flypack for field events only having to connect power, a multiview monitor and a laptop or mobile for control. Using the built in LAN ports or the internal Wireless Access Point for control. When the flypack was used in a studio environment it could be paired with a media server for streaming or recording, we advised on the build of the media server, integrating a 4K blackmagic decklink card. This also allowed the media server to be used as a Character Generator and Playout server alongside recording duties. 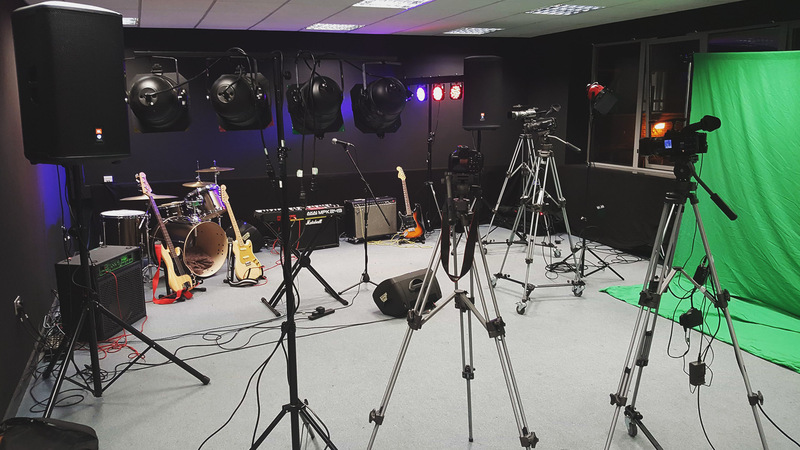 The college also reworked one of their spaces to be the new studio space, we assisted with installing some BNC patches for their cameras and also advised on the best lighting and sound options they could achieve with their existing resources.